The HIH6130 sensor IC has compensation for relative humidity in the range from 10 to 90 %RH and temperature in the range from 0 °C to 50°C, yielding typical accuracy of ±3 %RH and ±0.5°C. It consumes a very low amount of power while operated. The measurement data available over the I2C interface, requires a simple conversion formula to be applied since the HIH6130 already performs calibration. Featuring high reliability and long-term stability, high Signal-to-Noise (SNR) ratio, good accuracy, and low power consumption, Temp&Hum 5 click is an ideal solution for development of a range of different applications, including battery operated weather stations, thermostats and humidistats, microenvironment centers, respiratory therapy applications, air conditioners, HVAC systems, and other similar applications. 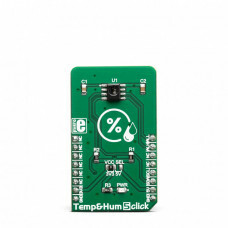 The main component of Temp&Hum 5 click is the HIH6130, a relative humidity and temperature sensor with I²C Interface, by Honeywell. This sensor IC integrates two very accurate sensing components: temperature sensor, and relative humidity sensor. The HIH6130 sensor integrates the complete temperature and humidity measurement system on a chip. Each sample is factory calibrated, providing an expected performance for each unit. The measurement results are available over the I2C interface. By applying simple conversion formulas, it is possible to obtain readings in physical units, directly. These conversion formulas are given in the HIH6130 datasheet and provide readings in °C and %RH. 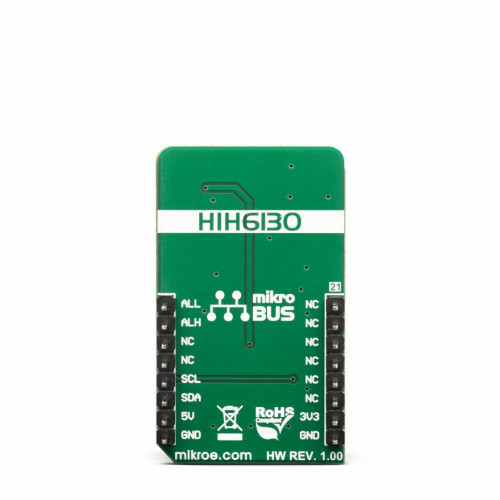 The HIH6130 features two ALARM outputs, which are used to indicate if the RH readings have exceeded, or fallen below a certain threshold, which can be programmed by the user, over the I2C. Besides the threshold values, the HIH6130 allows setting the polarity of the signal on these pins, as well as their driving topology (push-pull or open-drain). 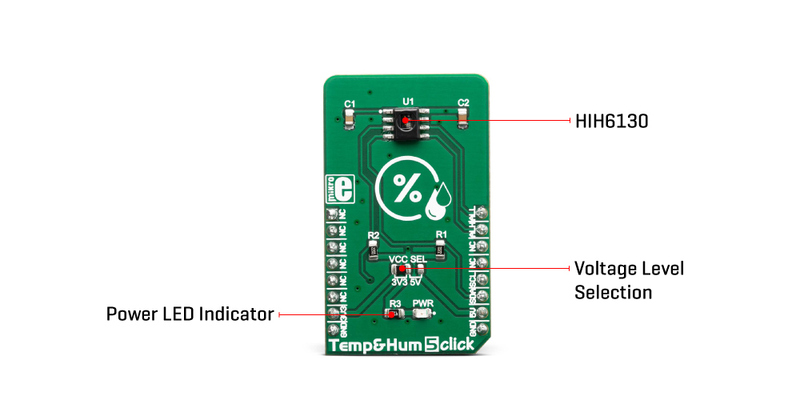 Temp&Hum 5 click does not feature any pull-up resistors, thus allowing the user to choose the most suitable method. ALARM pins are routed to the mikroBUS™ INT and PWM pins, which are labeled as ALH and ALL on this Click board™, respectively. The HIH6130 incorporates an accurate bandgap temperature sensor, which can measure the temperature in the range between -25°C and 85°C which is suitable for most demanding applications. The accuracy is greater if the range is narrowed down: when used over the range between 0°C and 60°C, the typical accuracy is ±0.5°C. Also, the repeatability of the temperature measurement is very good, since each sensor unit is factory-calibrated. The HIH6130 sensor IC can be reliably used for prolonged periods of time, as it has a very low thermal drift of less than 0.05°C per five-year interval. After the measurement has been converted by a high-precision 14-bit ADC, it is fed to a logic back-end which applies factory-calibrated correction and converts the raw data into a compensated value. By applying a simple conversion formula, the temperature measurement can be read directly in °C. Please note that the sensor will take some time to accommodate to the ambient temperature, especially if the temperature changes quickly, considering the thermal conductivity of the PCB itself. However, the Click board™ surface is not very large, resulting in lower thermal inertia. The humidity sensor is a laser-trimmed capacitor-based sensor which changes the capacitance proportionally to the relative humidity. However, the capacitance of this sensor is affected by changes in the ambient temperature, as well. However, the HIH6130 IC features a multilayered design which protects the sensing element from various application hazards, including condensation, dust, dirt, oils, and other environmental hazards, making it very robust and reliable, even in harsh conditions. The datasheet of the HIH6130 offers a map of the RH accuracy at different temperatures, covering a range of different values. The RH sensor accuracy varies in the range between ±1% and ±3%, depending on the measurement conditions. This table can be used to check the exact accuracy for some specific ℃ and %RH conditions. The industry-leading long-term stability of the humidity sensor is reflected in its low drift from 0.05% to 1.2%, during a 5-year interval. After the measurement has been converted by high-precision 14-bit ADC, it is fed to a logic back-end which applies factory-calibrated correction and converts the raw data into a compensated value. By applying a simple conversion formula, the temperature measurement can be read directly in %RH. Note that capacitor-based humidity sensors commonly suffer from a small hysteresis, which may occur if the sensor is used in very humid conditions for prolonged periods of time. However, this hysteresis is not irreversible. The HIH6130 datasheet specifies that its hysteresis should stay within the range of ±1 %RH. Temp&Hum 5 click uses the I2C communication interface. 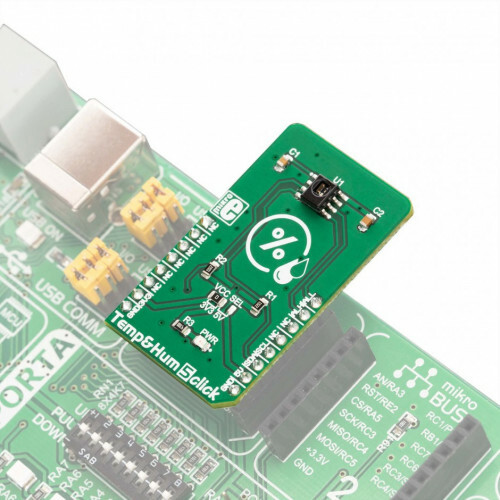 It has pull-up resistors for the I2C interface, connected to a voltage level that can be selected by moving the VCC SEL jumper to an appropriate position (3.3V or 5V), allowing the Click board™ to be interfaced with a wide range of different MCUs. Applications An ideal solution for development of various applications, including battery operated weather stations, thermostats and humidistats, microenvironment centers, respiratory therapy applications, air conditioners, HVAC systems, and other similar applications. On-board modules HIH6130, a relative humidity and temperature sensor with I²C Interface, by Honeywell. Key Features High accuracy, good linearity, proven reliability, long-term stability, excellent repeatability, two ALERT lines allow for simplified firmware, multilayered protection against environmental hazards, etc. This table shows how the pinout on Temp&Hum 5 click corresponds to the pinout on the mikroBUS™ socket (the latter shown in the two middle columns). 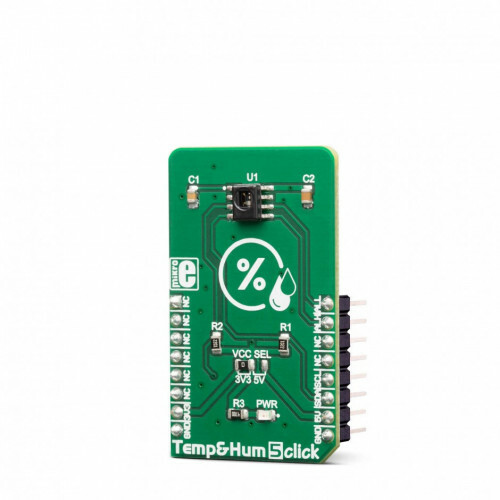 We provide a library for the Temp&Hum 5 click on our LibStock page, as well as a demo application (example), developed using MikroElektronika compilers. The demo can run on all the main MikroElektronika development boards. The library includes function for read Temperature and Relative Huminidy data and function for start measurement. The user also has the function for reads HIGH or LOW alarm state. Application Task - (code snippet) - Reads Temperature and Humidity data and this data logs to USBUART every 1 sec.